Soopa organizes annually an autumn hike at the end of August or in the beginning of September. It takes place in the mountaineous regions of either Finland, Sweden or Norway. The autumn hike includes challenging terrain, ever-changing weather and brilliantly colored trees. The ”Ruska” season is very often just starting and the wild berries are ripe for picking. While the ground is yet warm, the hiking terrain varies from the pleasant mountain shrub to the challenging rocky hills or watery swaps. It is not unusual for big rivers and other bodies of water to also make you change your route. Streams and other smaller rivers are waded through. Particularly on the autumn hike, it is possible, that the route you have planned might look simple and short enough on the map, but hiking that few kilometers might take you the whole day. The terrain has effect on how fast you are able to proceed. It is likewise good to keep in mind that a symbol on the map might carry a different meaning in different countries and regions. As an example, it can be assumed that throughout Norwegian mountain areas, there are rocky terrains (even it does not show up in the map). In Finland, however, rocky areas are marked specifically on the map. In the mountains, the autumn season begins already in August. The weather can change radically: during a week you can experience windy days, less windy days, rain and sunshine. During the night, the temperature can even drop to below zero. Because of the humidness and wind, the autumn hike can be the coldest hike of the year – therefore remember to take warm clothes and waterproof gear with you! It is not unusual to experience some snow at the end of August. Usually the autumn hike destinations do not provide wilderness huts, so it is more common to sleep in tents. The nights can get a bit chilly, so it is advisable to have a proper sleeping bag and sleeping mat, which can withhold the cold. On the other hand, sometimes the weather has been more like the summer, when it is possible to hike when wearing merely a t-shirt. On the hike, the only means of transport is by foot. Depending on the group, the daily progress can be anything between from 5 to 20 kilometers, and during the week it ranges from 50 to over 100 km. Some days can be a bit more laid-back, and some days might involve doing a day-trip, fishing or climbing up on top a nearby hill or mountain. In the Archives you can find out what has happened on previous autumn hikes: Hike in Loveriver and Kayaking hike in Inari-lake. The group divides into smaller groups for cooking. Usually the cooking groups consist of two or three people, and they share one cooker. During the hike, you will need to have breakfast, lunch and dinner everyday. The cooking groups/partners agree upon their food themselves. Take a look here for more tips on hiking food. Can I go on the Soopa Autumn hike? Even though you don’t have any previous hiking experience, that is not required. The autumn hike is suitable for beginners and hiking as part of a group is a safe and good way to gain experience. For many people, Soopa has been the place to start hiking in general. Before the hike, all participants are divided into groups of 2 to 6 people according to their fitness level, and their expectations for the hike. These groups hike independently on the route of their choice. When forming groups, we try to take into consideration previous hiking experience and ensure that there are experienced hikers as well as beginners in the same group. Throughout the hike, it is assumed that we will be sleeping in tents. It is advisable for people going on their first hike into the wilderness, to learn and read about the general principles of hiking, before going on the hike. The guidelines include tips on hiking in a group, how to pack, what gear to take and information about what to do in the case of emergency during the hike and how to resolve difficult situations, that might arise during the hike. It is recommendable even for experinced hikers to read these guidelines, as it can help them find new ideas on how to create an even more successful hike. The hike requires being in average shape, and the better shape you are in, the easier and nicer the hike will be to go through. It is our intention to form groups with people from approximately similar fitness levels, so usually there is an appropriate group for everyone. If you haven’t got a clue what shape you are in, you can take a test to evaluate your fitness level. This page have descriptions of some popular fitness tests. If you indeed do take a test, please be sure to fill in the name of the test and your result on the registration form. During the hike, the participants will be divided into small groups of 2 to 6 people, which proceed independently throughout the hike. The number one criteria for forming the groups is fitness level. Each group should have one or more experienced hikers. Any other expectations of the participants will be taken into consideration if possible. The underlying assumption on how groups work on Soopa’s hikes is based on the notion, that all participants are adults. It basically means that everyone in the has an equal opportunity to take part in the decisions the group makes before and during the hike. Every member of the group should make sure they have all the gear needed for the hike and they know how to use it. First-timers are requested to communicate to their groupleaders about their most important gear: about what kind of a sleeping bag they have, what is their sleeping mat like and what kind of a backpack they have. Especially if they do not have something they or are experiencing difficulties with the gear they have, it is required to give note beforehand – it is easier to arrange things in the city than in the wilderness. And during the hike, everyone should communicate about the problems they are experiencing – tiredness, health issues or trouble with gear. It is always better to be open and frank, before problems escalate to ridiculous measures. Each and everyone is responsible for successful communication. Before and during the hike, do talk and decide your route, how often you would like to have a breaks and what are the group’s ambitions and expectations – communication is essential! Gearing up for the hike is extremely important. The weather changes rapidly and the items you carry have to be functional and preferably waterproof. This detailed list, of course, is prone to changes – you can also be creative. Though, do not leave out anything mentioned on the list, unless you are absolutely sure you will not be needing it during the hike. If in doubt, ask the organizers, your group leader or other experienced hikers for help. The groups are formed in such a matter, that it might not be necessary to have all the things on the group list (such as tents or cookers), what matters is that some one in the group has something. If you lack any personal gear or equiptment, you can ask around from your friends and other people in Soopa, if you can borrow stuff from someone. On the hike, we will be sleeping in tents, therefore Soopa has about a dozen of tents, which are available for the groups take with them for free. At the end of August, the weather can be already very chilly, so the sleeping bags and sleeping mats should be accordingly warm enough (for sleeping in a tent). Pack your sleeping bag and clothes that they are waterproof. It is also advisable to ensure that your map, your dry food, the first aid kit as well as any other gear which should not get wet, is protected from water. These items can be packed in plastic bags or special canvas pouches, which are designed for that purpose. At the start of the hike, your backpack will weigh about 15-20 kilograms. Syysvaellus 2018: Lomsdal-Visten, Børgefjell ja Vindelfjällen, 25.8.-1.9. Voinko osallistua SOOPAn syysvaellukselle? Millaista syysvaelluksella on? Millaisia ihmisiä? Näihin ja moniin muihin yleisiin kysymyksiin syysvaelluksesta sekä ohjeellisen varustelistan löydät tästä. Jos olet vähän vaeltanut tai ensi kertaa ryhmävaelluksella tai SOOPAn vaelluksella, niin on erittäin tärkeää, että luet linkatun ohjesivun huolellisesti! SOOPAn vaellus poikkeaa yksin tai kaksin vaeltamisesta merkittävästi, koska vaellukset ovat ryhmävaelluksia, joissa ryhmän yhteistoiminta ja ryhmädynamiikka muovaavat vaelluksen kulkua. Vaelluksillemme osallistuvat henkilöt ovat täysi-ikäisiä, yleensä yliopiston tai ammattikorkeakoulun tulevia, nykyisiä tai valmistuneita opiskelijoita ympäri Suomen sekä vaihto-opiskelijoita ympäri maailman. Opiskelu tai opiskelemattomuus ei kuitenkaan ole pääsyvaatimus tai rajoite. Tärkeintä on iloinen, utelias ja reipas asenne, riittävä kuntotaso sekä terveys, ja tahto osallistua ryhmän toimintaan. Vaeltajiamme yhdistää samanlainen kiinnostus luonnossa liikkumiseen ja uusien elämysten löytämiseen. Kokemuksemme mukaan ihan toisilleen tuntemattomat ihmiset ovat ryhmäytyneet erinomaisesti ja löytäneet uusia ystäviä vaelluksiltamme. Ja aina voit pyytää kaverisi mukaan vaellukselle. Lomsdal-Visten-kansallispuisto mainitaan Norjan Sarekina. Sillä tarkoitetaan jylhää, vaativaa vaellusmaastoa, jossa on suuria korkeuseroja, vaikeita jokien ylityksiä, vähän merkittyjä polkuja, vähän muita vaeltajia ja muutama tupa. Sijainti meren rannalla tarkoittaa myös nopeita sään vaihteluja ja paljon sadetta. Lomsdal-Visten -puiston matalammat reuna-alueet mainitaan sopivan jopa perheen kanssa vaeltaville. Maastosta löytyy vuoria, vuonoja, koskia, luolia ja merilintuja. Lisätietoa löydät esitteestä ja alueen näet tästä kartasta. Børgefjell on taimenen kalastajan kirkasvetinen paratiisi. Karu, villi ja syrjäinen kuvaavat aluetta hyvin. Puiston itäosan tunturien jylhyyttä korostaa musta graniitti. Puistoon pätee aika samat luonnehdinnat kuin Lomsdal-Visteniin yllä. Sijainti sisämaassa hieman suojaa kovimmilta rannikon sateilta. Yhtenäinen ylänköalue on vähemmän vaativa vaellettava kuin Lomsdal-Vistenin korkeuserot. Lisätietoa löydät esitteestä ja alueen näet tästä kartasta. Vindelfjällen on Ruotsin suurin yhtenäinen luonnonsuojelualue. Sen laajasta monipuolisesta maastosta löytyy jokaiselle vaeltajalle jotain: korkeita tuntereita, vetisiä soita, metsiä ja paljakkaa. Ruotsin kuuluisin retkeilyreitin toinen pää on Hemavanissa. Siinä on helppo aloituspaikka selkeää merkittyä reittiä hakeville. Vindelfjällen soveltuu hyvin ensikertalaisille vaeltajille merkittyjen reittien, siltojen ja tupien vuoksi. Lisätietoa löydät esitteestä ja alueen näet tästä kartasta. Ilmoittautumisaika alkaa. Vaelluksen tarkat tiedot julkaistaan sähköpostilistoilla ja facessa. Ilmoittautumislomake avataan. Ilmoittautumisaika päättyy 23.7. perjantaina 3. elokuuta 23:50. Vaelluskokous, jossa ryhmäläiset tapaavat toisiaan ja järjestäjiä. Siellä myös sovitaan vaelluksen käytännön järjestelyistä, kuten ryhmien reiteistä sekä ryhmäkohtaisista varusteista ja ruokaryhmistä. Vaelluskokous on sunnuntaina 5.8. 12.8. klo 15 SOOPAn kololla (F1 ovella ulkona on ovisummeri). Matkaan lähdetään tilausajobussilla. Lähtöpäivänä lauantaiaamuna 25.8. bussin kyytiin pääsee Oulun linja-autoasemalta, Tuirasta Merikoskenkadulta sekä Linnanmaalta T2-oven edustan bussipysäkiltä. Lähtö on noin kello 7 aamulla Linnanmaalta. Lähtöaika linja-autoasemalta sovitetaan etelästä tulevan aamujunan mukaan, juna on 23:13 Helsinki – 08:12 Oulu InterCity 273. Eli bussi pakattuna ja Norjaa kohden 8:30, Hemavanissa n. 18:30 ja Norjassa n. 20-22. Paluupäivänä 1.9. Ouluun saavutaan alkuillasta/illasta n. 20:30, jotta ehditään etelään lähtevään junaan. Bussista voi jäädä pois samoissa paikoissa kuin lähtöpäivänä.Vaelluksen paluupäivälle ennen pitkää kotimatkaa on varattu sauna ja lounasruokailu, jotka kuuluvat vaelluksen hintaan. Peseytymisvälineet ja vaihtovaatteet voi jättää vaelluksen ajaksi bussiin, mielellään omalla nimellä varustettuun kassiin. Vaellukselle ilmoittaudutaan sähköisellä ilmoittautumislomakkeella. Viimeinen ilmoittautumispäivä on sunnuntai 23.7.2018 perjantaina 3.8. klo 23:50. Jos bussissa on tilaa, viimeisen ilmoittautumispäivän jälkeen voi vielä jälki-ilmoittautua ottamalla yhteyttä vaelluksen järjestäjiin (soopa.vaeltaa(at)gmail.com). Jälki-ilmoittautumisesta peritään 15 euron lisämaksu, joka tulee maksaa ilmoittautumisen yhteydessä. Koska jälki-ilmoittautuminen tapahtuu ryhmäjaon jälkeen, niin emme voi taata jälki-ilmoittautuneelle paikkaa juuri hänen kuntoonsa ja kokemukseensa sopivassa ryhmässä. SOOPAlla on oikeus evätä henkilön osallistuminen vaellukselle, mikäli katsotaan, että henkilö on vaaraksi itselleen ja/tai muulle ryhmälle. Tällaisia tekijöitä voivat olla esimerkiksi riittämätön kuntotaso, terveydentila tai hankaluudet yhteyden saamisessa. Eväystilanteen sattuessa vaelluksen maksut palautetaan henkilölle. Mikäli vaellus joudutaan perumaan osallistujien vähäisyyden takia, palautetaan jo maksetut osallistumismaksut sekä halutessasi myös SOOPAn jäsen-/kannatusjäsenmaksu, ellet ole osallistunut / osallistumassa muuhun toimintaan vuoden aikana. Vaellukselle osallistujien tulee olla SOOPAn jäseniä. Vaelluksen hinta on 95 euroa. Hintaan kuuluvat kartat, matkat sekä sauna ja ruokailu vaelluksen päätteeksi. Vakuutus ei sisälly hintaan, joten jokaisen lähtijän tulee huolehtia siitä itse. SOOPAn jäsen- tai kannatusjäsenmaksu vuodelle 2018 tulee olla maksettuna viimeistään viimeisenä ilmoittautumispäivänä 23.7.2018. 3.8.2018 Ilmoittautumistasi ei oteta huomioon, jos et ole maksanut maksuja ajoissa. Katso tästä: SOOPAan liittyminen sekä maksuohjeet jäsenmaksulle ja vaellusmaksulle. Autumn hike 2018: Lomsdal-Visten, Børgefjell and Vindelfjällen, 25.8.-1.9. SOOPA’s (University of Oulu Scout Troop) traditional Autumn Hike this year will be heading to a totally new area in Norway. That area is also the southmost area that SOOPA has explored in Norway. This time we are heading to National parks of Lomsdal-Visten and Børgefjell. Those parks are right next to each other. the first is in the coast with fjords and the other next to border of Sweden. On the bus travel we will also pass the familiar (from other SOOPA hikes) area of Vindelfjällen. You can also leave the bus earlier and go to hike Vindelfjällen if you like. Can I take part of the SOOPA hike? What it is like to hike in autumn time? What kind of people are other hikers? Answers to questions above and many other about autumn hike including gear list you will find from this page. If you have not hiked a lot before, you are first timer in group hike or SOOPA hike then it is absolutely necessary for you to read carefully that page! Hiking with SOOPA differs from hiking alone or pairs significantly. SOOPA hikes are group hikes that means that group must work together and group dynamics shape the spirit of the hike. People participating our hikes are adults, usually future, present or past students of universities of Finland and exchange students from all over the world. However student status is not the qualification for the hike nor missing student status restriction to take part to the hike. The most important aspects are cheerful and brave attitude, curious mind, adequate fitness and health and a will to take part of the group. Our hikers have mutual interest in hiking and experiencing the nature. According our experience even people that did not know each other before the hike have made the group work perfectly and found new friends from the hike. Lomsdal-Visten national park has a reputation as the Sarek of Norway (Sarek in Sweden is the largest protected wilderness area in Europe and known for a rugged terrain and area without tracks or huts). Lomsdal-Visten has the challenging landscape with high altitude differences and difficult river crossings, few trails and only few cabins. You have to carry with you all you need, calculate good time and be prepared for really inexhaustible weather. Area is characterized by heavy rain and frequent weather changes. Surrounding areas of Lomsdal-Visten are easier to hike and are suitable for first timers also. From Lomsdal-Visten you can find mountains, fjords, streams, caves and birds. You will find more info from this leaflet and you can see map here. Børgefjell a paradise for trout fishing. Remote, rugged and wild are three words that perhaps characterize Børgefjell best. Eastern part of the park have fjells of dark granite. Most of the characteristics above about Lomsdal-Visten are valid for also to Børgefjell. It is maybe not that rainy and it is easier to hike than Lomsdal-Visten. You will find more info from this leaflet and you can see map here. Vindelfjällen is the largest nature reserve in Sweden. Its diverse terrain offers something for every hiker: high mountains, wet swamps, forests and treeless plateau. The most popular hiking route Kungsleden starts from Hemavan. That is easy place to start hiking with marked track and several huts (you need to pay for sleeping there). Vindelfjällen is good are for first time hikers because of marked paths, bridges over streams and huts. You will find more info from this leaflet and you can see map here. We will travel to the hiking area by bus. Bus will start early in the morning in Saturday 25th August. Pick-up schedule and places are the following: 1) 7:30 a.m. Linnanmaa parking area near T2 door (Uni. campus). 2) 8 a.m. Tuira (Merikoskenkatu) and 3) 8:15 a.m. the Central Bus Station in the city centre (we are going to wait morning train InterCity 273, 23:13 Helsinki – 08:12 Oulu). Bus leaves Oulu 8:30 a.m. and will be in Hemavan about 6:30 p.m. and in Norway about 8-10 p.m.
We will return back to Oulu on Saturday evening 1th of September about 8:30pm. When we return to Oulu, you can be dropped off at the same places. The departure and arrival times will be arranged according to the arrival/departure times of the trains from southern Finland. The exact schedule for the hike will be announced later in the instructions sent to the hikers after the sign-up period has ended. Before returning back home we will have sauna and after-hike meal, which are included in the price. Please note that you should take along towels, swimming suit, shampoo and fresh clothes in a separate bag for the after-hike sauna. Those things can be left on the bus during the hike so you do not have to carry them with you for a week. Sign up for the hike with this online form. The last day for registration is 23th of July 2018 Friday the 3th of August 11:50pm before midnight. This is also when all the payments for the hike are due. If you sign up after this it will cost 15 euros extra and you should also send email to the hike organizers about your participation. Sign up after is only possible if there are places free in the bus and proper group for you can be found. SOOPA has the right to deny the hike from a person who is seen as dangerous to himself or the group. This might occur due to some of following reasons: poor fitness level, lack of hiking skills or health condition. In such a case, all payments will be reimbursed to that person. SOOPA hikes are member only so all hikers must pay SOOPA membership free. All SOOPA’s events are alcohol-free. The price for the hike is 95 euros. The price includes transportation from Oulu to the hiking area and back, sauna and a buffet lunch on the way back, and a map of the hiking area. The price does not include any insurance. Everyone needs to get one individually. The participants must also pay SOOPA’s member or supporting member fee for the year 2018 to take part in the hike. Please follow the instructions for becoming a SOOPA member and paying the membership fee. The payments for the hike have to be paid to SOOPA’s bank account by 23rd of July at the latest, so we recommend that you can pay it right after signing up. Those who have not paid the participation fee for the hike or SOOPA’s membership fee by the deadline will not be considered as participating on the hike. If they still want to join the hike, they must follow the instructions for late sign-up. If it is not possible for you to pay to SOOPA’s bank acocunt then ask your finnish friend use her bank account to pay on behalf of you. In that case ask your friend to enter your name to the message field. Welcome to the Autumn hike! Norjan Ruijaan ja Suomen Lappiin 31.3.-7.4. Vuoden 2013 syysvaelluksella otettiin uusi kohde SOOPAn vaelluksille, Stabbursdalenin kansallispuisto ihan pohjoisessa Norjassa – Ruijan läänissä. Nyt palaamme sinne takaisin katsastamaan, miltä nämä tunturit näyttävät talviasussa. Stabbursdalenin kansallispuistossa on karuja tuntureita, hienoja näkymiä Porsanginvuonoon, kivikkoisia rakka-alueita ja jyrkkiä jokilaaksoja. Kansallispuiston erityiskohde on maailman pohjoisin mäntymetsä. Vaihtoehtoisesti voi jäädä bussista aikaisemmin jo Suomen puolella ja vaeltaa Muotka- ja Paistuntureilla tai Kevon kanjonissa. Vaellukselle lähdetään Oulusta lauantaina aamulla 31. maaliskuuta ja paluu on seuraavana lauantaina illalla 7. huhtikuuta. Vaelluksen hinta on 90 euroa sisältäen kyydit, kartat, loppuruokailun ja loppusaunan. Mikäli et ole aiemmin ollut mukana soopan vaelluksilla, tai sinulla on kysymyksiä vaelluksesta infotilaisuus pidetään keskiviikkona 28.2 klo 17 kololla. Tilaisuus ei sido mihinkään, joten jos vähänkään kiinnostaa niin tule rohkeasti paikalle! Ilmoittaudu tästä linkistä maanantaihin 19.3.klo 23:59 mennessä. Pääsiäisvaelluksella osanottajat jaetaan noin 4-6 hengen kokoisiin ryhmiin. Jokaisessa ryhmässä on mukana kokeneempia vaeltajia, jotka mielellään opastavat vasta-alkajia. Ryhmät liikkuvat maastossa itsenäisesti ja jokainen ryhmä valitsee itse vaellusalueensa ja reittinsä omien toiveidensa mukaisesti. Vaellusmaastoja tarjoavat Stabbursdalenin kansallispuisto, Kárašjohkan alue, Muotka- ja Paistunturien laajat erämaa-alueet sekä kuuluisa Kevon luonnonpuisto. Jokaiselle vaeltajalle löytyy näiltä seuduilta jotakin, olitpa sitten täysin vasta-alkaja tai sitten kokenut vaeltaja. Maastossa liikutaan hiihtäen, ja viikon mittaan hiihtoa kertyy ryhmästä riippuen noin 50 kilometristä reiluun sataan kilometriin. Pääsiäisvaelluksella vaeltajat ovat tyypillisesti yöpyneet teltoissa. Suomen puolen kohdealueilta tosin löytyy muutamia autiotupia ja kotia, joten vaelluksen keskellä voi halutessaan nauttia myös tulen lämmöstä ja autiotuvan tai kodan ainutlaatuisesta tunnelmasta. Toisaalta, karuilta Muotka- ja Paistunturien erämaa- alueilta löytyy haasteita kokeneille vaeltajille. Voit lähteä mukaan vaellukselle, vaikka et olisi aiemmin ollut mukana SOOPAn toiminnassa tai partiossa. Aiempi vaelluskokemuskaan ei ole välttämätöntä ja moni onkin aloittanut vaellusharrastuksensa SOOPAn reissuilla. Varsinkin ensimmäistä kertaa vastaavalle vaellukselle tai SOOPAn reissulle mukaan lähtevien kannattaa tutustua yleisiin retkiohjeisiin ennen lähtöä. Ohjeisiin on koottu muun muassa vinkkejä ryhmässä vaeltamisesta, pakkaamisesta ja varusteista sekä tietoa mahdollisista ongelmatilanteista vaelluksella ja niiden ratkaisemisesta. Myös kokeneemmille vaeltajille ohjeistus saattaa antaa uusia ideoita miellyttävämmän vaelluksen toteuttamiseen. Vaellus vaatii kohtuullista fyysistä kuntoa. Jos sinulla ei ole minkäänlaista käsitystä omasta kuntotasostasi, voit tehdä jonkin kuntotestin arvioidaksesi kuntoasi vaellusta varten. Kunnon testaaminen ei ole välttämätöntä, mutta ryhmäsi vaelluksesta tulee huomattavasti mielekkäämpi, kun se koostuu henkilöistä, joiden kuntotaso on suunnilleen sama. Sopivia kuntotestejä voit katsella esimerkiksi sivulta yths.fi. Jos suoritat jonkin kuntotestin, kirjaa testin nimi ja tulos ilmoittautumislomakkeen Fyysinen kunto -kohtaan. Vaelluksesta järjestetään infotilaisuus kiinnostuneille keskiviikkona 28.2. klo 17.00 Kololla. Tilaisuudessa kerrotaan vaelluksen järjestelyistä ja siitä, mitä reissulle valmistautuessa ja itse reissulla kannattaa ottaa huomioon. Paikalla voi myös esittää mieltä askaruttavia kysymyksiä. Vaellukselle ilmoittautuneet jaetaan ryhmiin pääasiassa kuntotason mukaan ja jokaiseen ryhmään sijoitetaan myös yksi tai useampi kokeneempi vaeltaja. Osallistujien muut vaellukseen liittyvät toiveet otetaan huomioon ryhmäjaossa mahdollisuuksien mukaan. Jokaiselle ryhmälle nimetään ryhmänjohtaja, joka on yleensä aiemmin SOOPAn vaelluksilla mukana ollut tai muuten kokeneempi vaeltaja. Ryhmänjohtajan tehtävänä on hoitaa ryhmän ja vaelluksen järjestäjien välinen yhteydenpito ennen vaellusta sekä varmistaa ennen lähtöä, että ryhmällä on kaikki tarvittavat ryhmäkohtaiset varusteet. Kaikki ryhmän jäsenet ovat kuitenkin vastuussa ryhmän viestinnän onnistumisesta! Vaelluksella tarkoitukseen ja vaihteleviin sääoloihin soveltuvat varusteet ovat tärkeät, sillä sääolosuhteet voivat vaihdella tuulettomasta auringonpaisteesta hyytävään tuiskuun tai paukkuvaan yöpakkaseen. Erityisesti makuupussin ja -alustojen tulee olla riittävän lämpimät teltassa yöpymiseen. Katso ohjeellinen varustelista pääsiäisvaellukselle. Listassa mainittujen ryhmäkohtaisten varusteiden omistaminen ei ole välttämätöntä, sillä ryhmät muodostetaan siten, ettei yhteisiä varusteita jää puuttumaan. Jos henkilökohtaisia varusteita puuttuu, niitä voi kysellä lainaan kavereilta tai SOOPAn sähköpostilistalta: soopa (a) lists.oulu.fi, huomaa myös kuinoma.fi. SOOPAlla on kymmenkunta talvikelpoista vaellustelttaa, joita lainataan vaellusryhmille ilmaiseksi. Lisäksi SOOPAlla on hiihtokumisaappaita ja metsäsuksia sekä joitain taukotakkeja, joita voi vuokrata vaellusta varten. Kysy lainattavista ja vuokrattavista välineistä lisää varastonhoitajalta: venla.vuolanto (a) student.oulu.fi. Ruoanlaittoa varten vaellusryhmä jakautuu 2-3 hengen ruokaryhmiin. Ne ovat yleensä kahden hengen ryhmiä ja yhtä ruokaryhmää kohti on yksi keitin. Vaelluksella tarvitaan joka päivä aamupala, lounas ja päivällinen sekä välipaloja. Ruokaryhmät sopivat vaellusruoasta itsenäisesti. Katso lisäohjeita vaellusruoasta. Ilmoittautumisajan päätyttyä ennen vaellukselle lähtöä osallistujille pidetään vaelluskokous. Kokouksen tarkoituksena on, että ryhmäläiset pääsevät tapaamaan toisiaan ennen vaellusta ja suunnittelemaan yhdessä reitin. Vaelluksen järjestäjät ovat paikalla kokouksessa, ja heiltä voi kysyä lisää vaelluksen käytännön järjestelyistä. Kokouksessa vaellusryhmät viimeistään sopivat ruokaryhmistä, reitistä ja ryhmäkohtaisista varusteista – opastusta näihin asioihin saa tarvittaessa vaelluksen järjestäjiltä. Vaelluskokous on erinomainen paikka kokemattomammille vaeltajille kysyä mieltä askarruttavista asioista ryhmältä tai muilta kokeneemmilta vaeltajilta. Jos et pääse vaelluskokoukseen, ole yhteydessä ryhmääsi ja ryhmänjohtajaasi, jotta pysyt kärryillä siitä mitä kokouksessa on sovittu. Jos ryhmä ei päätä yhdessä sovittavista asioista vaelluskokouksessa, on ryhmänjohtajan vastuulla, että ne tulevat hoidettua ja järjestäjille ilmoitettua ennen vaellukselle lähtöä. Vaelluskokouksen ajankohta ilmoitetaan ryhmäjaon jälkeen infoviestissä. Matkaan lähdetään tilausajobussilla. Lähtöpäivänä lauantaina 31.3. bussin kyytiin pääsee Oulun linja-autoasemalta, Tuirasta Merikoskenkadulta sekä Linnanmaalta. Tarkka lähtöaika ilmoitetaan myöhemmin. Lähtöaika linja-autoasemalta sovitetaan tarvittaessa etelästä tulevan aamujunan mukaan. Paluupäivänä 7.4. Ouluun saavutaan ennen iltaysiä ja paluuaika sovitetaan etelään lähteviin juniin. Bussista voi jäädä pois samoissa paikoissa kuin lähtöpäivänä. Vaelluksen paluupäivälle ennen pitkää kotimatkaa on varattu sauna ja lounasruokailu, jotka kuuluvat vaelluksen hintaan. Peseytymisvälineet ja vaihtovaatteet voi jättää vaelluksen ajaksi bussiin. Vaellukselle ilmoittaudutaan sähköisellä ilmoittautumislomakkeella. Viimeinen ilmoittautumispäivä on maanantai 19.3.2018 klo 23:59. Jälki-ilmoittautumisista peritään 15 € lisämaksu. Mikäli ilmoittaudut myöhässä, laita asiasta myös sähköpostia vaelluksen järjestäjille. Mukaan mahtuu 49 nopeinta ilmoittautujaa. SOOPAn jäsenillä on etuoikeus paikkoihin kannatusjäseniin nähden, mutta vain harvoin ovat bussit olleet niin täynnä. SOOPAlla on oikeus evätä henkilön osallistuminen vaellukselle, mikäli katsotaan, että henkilö on vaaraksi itselleen ja/tai muulle ryhmälle. Tällaisia tekijöitä voivat olla esimerkiksi riittämätön kuntotaso tai hiihtotaito, terveydentila tai hankaluudet yhteyden saamisessa. Eväystilanteen sattuessa vaelluksen maksut palautetaan henkilölle. Vaelluksen hinta on 90 euroa. Hintaan kuuluvat kartat, matkat sekä sauna ja ruokailu vaelluksen päätteeksi. Vakuutus ei sisälly hintaan, joten jokaisen lähtijän tulee huolehtia siitä itse. Vaelluksen osallistumismaksu maksetaan SOOPA ry:n pankkitilille. SOOPAn jäsen- tai kannatusjäsenmaksu vuodelle 2018 tulee olla myös maksettuna vaellukselle osallistuttaessa. Katso SOOPAan liittyminen sekä jäsenmaksun maksuohjeet. Vaellus ja jäsen-/kannatusjäsenmaksut tulee olla maksettuna viimeistään viimeisenä ilmoittautumispäivänä 12.3.2018. Ilmoittautumistasi ei oteta huomioon, jos et ole maksanut maksuja ajoissa. Mikäli vaellus joudutaan perumaan osallistujien vähäisyyden takia, palautetaan jo maksetut osallistumismaksut sekä halutessasi myös SOOPAn jäsen-/kannatusjäsenmaksu, ellet ole osallistunut / osallistumassa muuhun toimintaan vuoden 2018 aikana. Jos joudut perumaan vaellukselle osallistumisesi sairastumisen vuoksi, voit jättää kirjallisen pyynnön vaellus- ja jäsenmaksun palautuksesta vaelluksen järjestäjille (soopa.vaeltaa(at)gmail.com), jotka välittävät sen SOOPAn hallitukselle. Easter Hike 2018: Finnmark in Norway and Lappland in Finland 31.3.-7.4. During the 2013 Autumn Hike we discovered a new area for hiking – Stabbursdalen National Park in the Arctic Finnmark of Norway. Now we intend to go back there and see how it looks in wintertime and experience unforgettable adventures and the awesome nature! The Stabbursdalen National Park has rugged hills, great views to the Porsanger fjord, rocky terrains and deep river valleys. The special attraction there is the world’s northernmost pine forest. Alternatively you can get off the bus in Finnish Lapland and hike in the regions of Paistunturit, Muotkatunturit, Kevo Strict Nature Reserve and Kárašjohka. The bus for the Easter Hike will leave from Oulu on Saturday morning the 31st of March and we will return back Saturday evening the 7th of April. The total price for the hike is 90 euros including transportation, maps of the area, the after-hike meal and sauna. You are welcome to join the hike even if you are not a Scout or have no previous hiking experience – provided you are able and know how to ski. If you have not taken part in SOOPA hikes before or you have questions about this hike then there is a special meeting just for you in Wednesday 28.2. 5pm at Kolo (look at Kolo location in the map in right —>). Registration form is here, sign-up at no later than Monday the 19th of March 11pm. On the annual Easter Hike the participants are divided in to groups of 4-6 people. Each group will contain experienced hikers who are happy to advice beginners. The groups hike independently and each group is free to choose their own hiking area and route according to their wishes. The possible hiking areas are the Stabbursdalen and Kárašjohka regions in Norway and the vast Muotka- and Paistunturi wilderness areas as well as the famous Kevo Strict Nature Reserve. There is something for everybody in these regions, whether you are a beginner or an experienced wilderness adventurer. A typical hike includes 50-100 kilometres of skiing. On the Easter Hike the hikers typically spend their nights in tents. The Lappland region also contains a few wilderness huts, so it is possible to enjoy a little warming fire and the unique atmosphere of the wilderness huts during the hike. On the other hand, the harsh wildernesses of Stabbursdalen provides challenges for the experienced hikers. Before leaving for the Easter Hike you should read through our general guidelines for SOOPA’s hikes, especially if you haven’t been on a hike before. The guidelines may also give useful ideas for more experienced hikers to make the hikes even more pleasant. Hiking requires at least moderate physical fitness. If you don’t have any clue of your fitness level, you can test your fitness for the hike by doing a fitness test (there are plenty online, for example google: ’walking test’). Testing your fitness is not necessary, but hiking with the group will be much more pleasant when the members have about the same capability and attitude for hiking. If you do a test, mark down the name and result of the test and submit the information in the ”Physical Fitness” section of the registration form. There will be an info event about the practical arrangements of the hike on Wednesday 28.2. at 5 pm at Kolo (look Kolo location in the map in right —>). In this event you can also get useful advice on what to do before the hike and during the hike. In this event you can ask the organizers and experienced hikers all the mind-bugging questions about the hike that you can think of. When arranging the groups, we will do our best to take into account the fitness level of the hikers as well as their personal wishes. There will also be some more experienced hikers in each group. Each group will also have a group leader who is usually a more experienced hiker. The most important tasks of the group leader is to make sure the group has got all the necessary gear they need and inform SOOPA if there are any problems before the hike. Every group member is responsible that communication in the group works. Food will be prepared in small cooking groups, usually consisting of 2 people. Breakfast, lunch and dinner will be needed for each hiking day, and the cooking groups can decide themselves what they would like to take. Read more about hiking food. The Easter Hike can be challenging so it is important to have suitable gear for arctic weather conditions. Especially first-time hikers should take time to get prepared and check their equipment with care – especially the sleeping bag and the mattress must be suitable for sleeping in a tent. The gear list for a winter hike gives an overview of the most important equipment, both personal and group gear. It is not necessary to own all the group gear mentioned in the list because the group members can agree upon how to get the equipment needed. Tents suitable for camping can be borrowed from SOOPA free of charge. There are also other places where you can ask to borrow hiking gear such as www.kuinoma.fi or emailing other SOOPA members: soopa(at)lists.oulu.fi. For some rentable gear such as skis, boots or down jackets you can ask the SOOPA storage-keeper: venla.vuolanto (a) student.oulu.fi. It is important to be active in the planning phase! Your group needs to know what you want to do, the gear you have and the overall situation concerning the hike. How else are you going to solve any of the problems you might come across? A pre-trip meeting will be held before the hike for all the participants. It is an opportunity for you to get to know your fellow group members before the hike, and plan about the route you want to take. Moreover, the groups can check that they have all the needed group gear, and assign cooking groups for the hike. The meeting is also an excellent place for new hikers to get more information about the hiking area as well as learn some basics about the gear and safety on hikes. There will be experienced hikers who are more than happy to answer any questions you may have. If the group does not resolve the afore-mentioned things in the pre-meeting, it is the group leader’s responsibility to make sure all the needed arrangements are made before departure. If you cannot make it to the meeting, please contact your group and group leader to get all the necessary information. The meeting time will be announced by email to registered hikers. We will travel to the hiking area by bus. 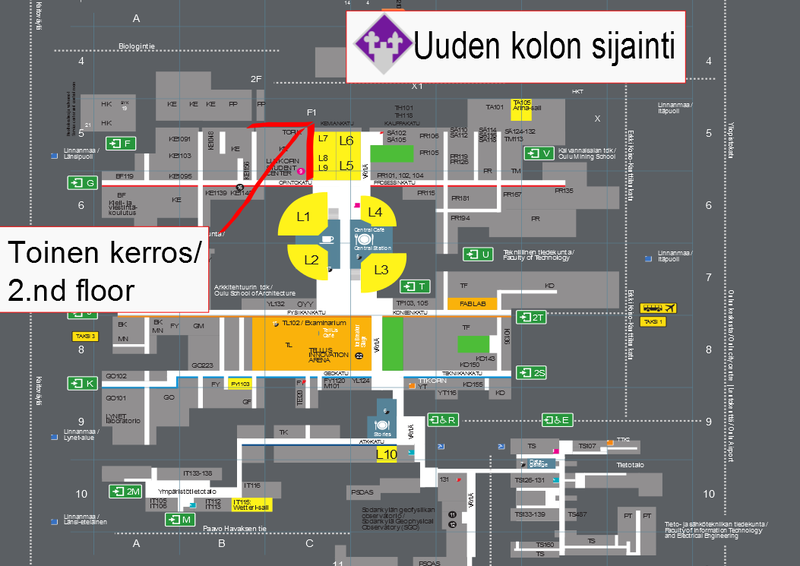 Pick-up places are the following: 1) The Central Bus Station in the city center, 2) Tuira (Merikoskenkatu) or 3) Linnanmaa (Uni. campus). When we return to Oulu, you can be dropped off at the same places. We will depart from Oulu early in the morning of Saturday 31nd of March and be back in Oulu on Saturday evening 7th of April. The departure and arrival times will be arranged according to the arrival/departure times of the trains from southern Finland. The exact schedule for the hike will be announced later in the instructions sent to the hikers after the sign-up period has ended. Before returning back home we will have sauna and after-hike meal, which are included in the price. Please note that you should take along towels, shampoo and fresh clothes in a separate bag for the after-hike sauna. Those things can be left on the bus during the hike so you do not have to carry them with you for a week. Sign up for the hike with online form. The last day for registration is 19th of March 2018, before midnight. This is also when all the payments for the hike are due. If you sign up after this it will cost 15 euros extra and you should also send email to the hike organizers about your participation. The first 49 hikers to sign up will be automatically selected on the hike. Preference is given to SOOPA members that are currently studying at the University, but usually there has been room for everybody. SOOPA has the right to deny the hike from a person who is seen as dangerous to himself or the group. This might occur due to some of following reasons: poor fitness level, lack of skiing skills or health condition. In such a case, all payments will be reimbursed to that person. The price for the hike is 90 euros. The price includes transportation from Oulu to and from the hiking area, sauna and a fancy meal on the way back, as well as a map of the hiking area. The price does not include any insurance, thus everyone is responsible for themselves. The participants must also pay SOOPA’s membership or supporting membership fee for the year 2018 to take part in the hike. Please follow the instructions for becoming a SOOPA member and paying the membership fee. Remember to also pay SOOPA’s membership or supporting membership fee for the year 2018. The payments for the hike have to be paid to SOOPA’s bank account by no later than the 12nd of March, so it is highly recommend that you can pay right after signing up for the hike. Those who have not paid the participation fee for the hike or SOOPA’s membership fee by the deadline will not be considered as participating on the hike. If they still want to join the hike, they must follow the instructions for late sign-up (which results in extra 15 euros fee). If SOOPA must cancel the hike for some reason, all payments will be returned. You may also inquire for the the membership fee to be returned, if you do not intend to take part in any other SOOPA events during this year. If you get ill before the hike, you may ask about the reimbursement of the payments with a written message from the persons in charge of the hike (soopa.vaeltaa(at)gmail.com) and they will forward your message to SOOPA board, who will make the decision. Welcome to the Easter Hike!